distribution Statewide, though possibly absent along the extreme northeastern coastal areas. Likely found in all mountain counties, though a few in the northern mountains lack records. abundance Common to locally very common in the Piedmont and most of the Coastal Plain; fairly common to locally common in much of the mountains. Not common in the eastern part of the Coastal Plain, but at least uncommon to fairly common, except rare to absent in the extreme northeastern counties. flight Downstate, occurs from late April to late September (and probably later) in the Coastal Plain and to late October in the Piedmont. The mountain flight occurs between mid-May and mid-September. habitat Small and mainly wooded creeks/streams, typically with a few riffles. Less often along rivers or larger streams without riffles. Typically closer to forested creeks than other dancers. comments This is still another dancer species that is common across most of the state and occurs in nearly all counties, but as with many, it is scarce or absent in the extreme northeastern part of the Coastal Plain. 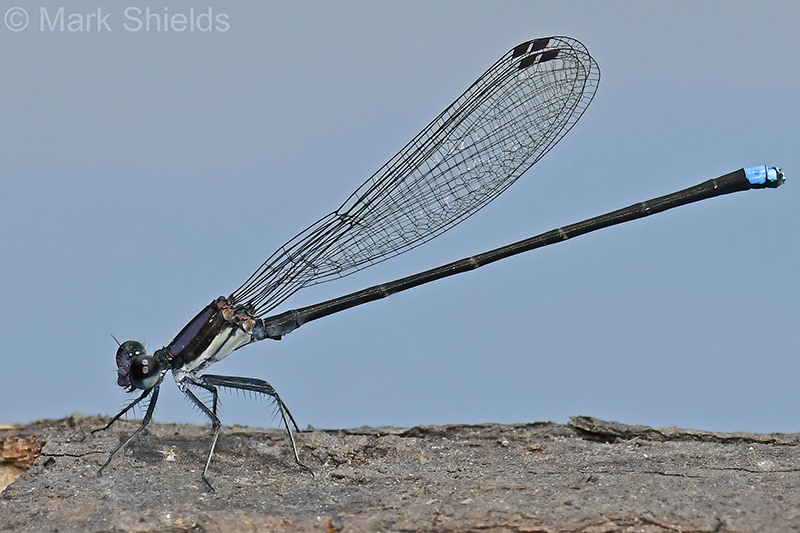 In GA, Beaton (2007) says it is "Often the most numerous dancer at any given site"; however, in NC, it shares abundance with a number of other dancer (Argia) species and does not seem quite as numerous as the Variable, Powdered, and Blue-ringed dancers. Comment: New Hanover, 2018-06-08, Northeast Cape Fear River at Riverside Park, Castle Hayne. Photo of female. Comment: Mecklenburg, 2017-07-08, Mallard Creek between Mallard Creek Church Rd and Harris Blvd.